Recently I posted this painting on Facebook and folks were interested in something from Forbes that was not Great War. Well – there are more. 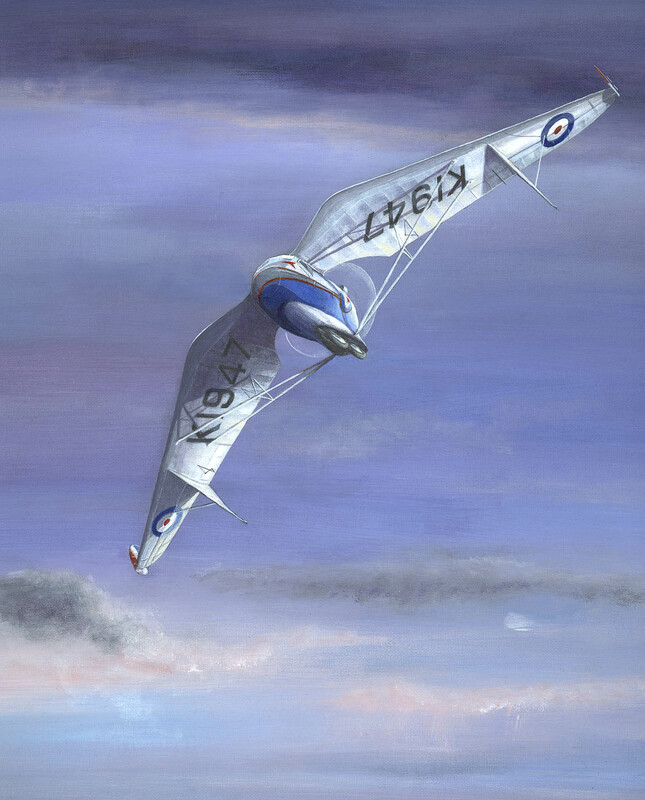 For my second ever submission to the Guild of Aviation Artists’ exhibition there were two aircraft – and not a tail between them. I just love the paintings of Turner and I’d been at his Water Colours exhibition in Edinburgh. There were a few that he’d painted on blue paper which I thought looked especially attractive. 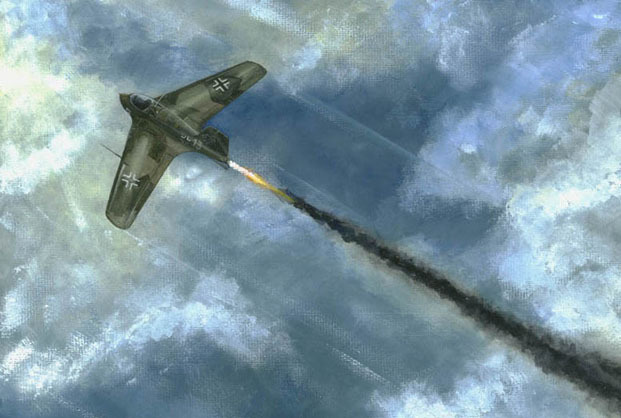 So naturally plagiarism raised its ugly head and this Me 163 is accordingly a watercolour on a blue paper…. Not a GREAT pilots’ aeroplane the 163, as you sat between two fuel tanks of corrosive stuff that exploded when mixed. Or melted skin clean off if that unfortunate skin was exposed to it. Plus, it landed on a big skid with a predictable wallop and if the fuels hadn’t been totally drained in the flight they would just explode. Aye – volunteers line up here……….. The other tailless was the more approachable Westland Pterodactyl IV. No short-range, late-war fighting rocket like the 163, this was the second flying experiment of Westland to the designs of the innovative Mr. Geoffrey Hill. It flew in 1931 and in the age of open-cockpit bi-planes here was a glazed-cabin, swept-back flying wing and the wings SWUNG to more suitable angles of sweep for the speed involved. A really amazing machine. ..and perhaps yet more things without tails. This Post was posted in Aero Painting, History and tagged Me163B, Westland Pterodactyl IV. Bookmark the permalink.